Welcome to my B9 Project site! Earlier Assembly of my B9 (11/30/02). 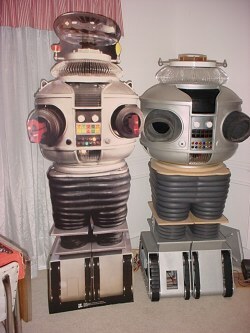 The Cardboard Standup ("restored" robot") next to my B9 in progress. Warning - Warning! - Danger! 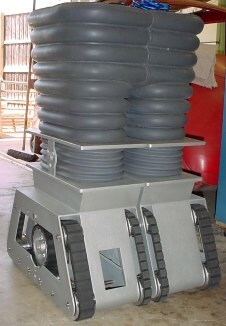 The original "Hero" robot, (season 2). Are those cables trailing behind you? 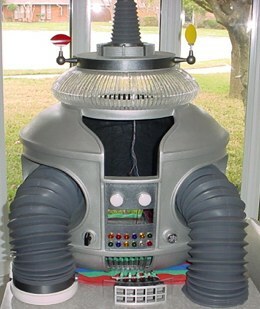 I won't tell you the 'ever since I was a kid story', but I am finally building my rendition of the Lost In Space B9 Robot. 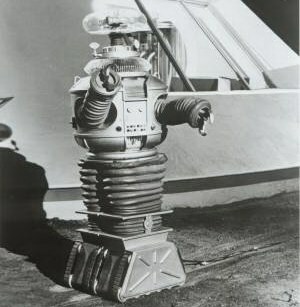 As you may know the original robot for the TV show was just a costume with a man inside. 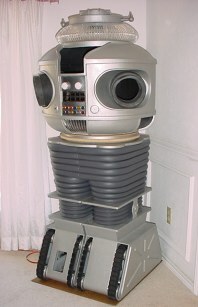 I'm not building a costume, but a mechanical version that looks an awful lot like the one from the TV show. He will be life size and fully animated via remote control. Thanks to the B9 Robot Builders Club for their web site, resources and members, without them this wouldn't be possible. The Club is now Officially Licensed, July 2003, thanks to Mike Joyce B9Creations. The B9 Robot Builders Club is now an officially sanctioned club! 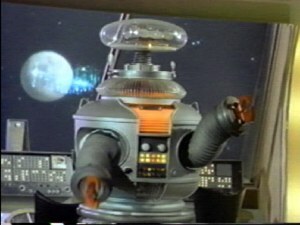 Lost in Space® and Robot B9™ are ©2003 Space Productions. All Rights Reserved. Lost in Space® is a registered trademark of Space Productions. Licensed by Synthesis Entertainment. The B9 Robot Builders Club is ©2003 B9Creations. All Rights Reserved.